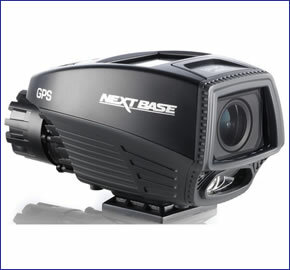 Nextbase RIDE is a motorcycle bikecam. This high quality dash cam records in 1080p Full HD quality at 30 frames per second. With the Nextbase RIDE you have a choice of either viewing video on the inbuilt 1.5-inch screen or you can download video to your smartphone screen using the inbuilt WiFi connectivity. GPS and G-Sensor technology is also included in the Nextbase RIDE. You can then view recorded video on your computer along with GPS position on a map and G-Forces. The RIDE features a loop record mode and it is waterproof to IPX6 standards. 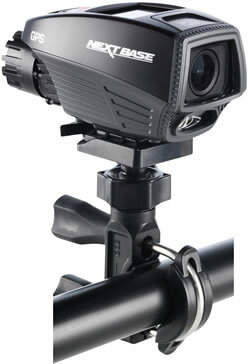 The Nextbase RIDE is a bikecam designed for use on a motorcycle. This is the worlds first high quality motorbike bike cam. Included in the box is a Universal RAM bike mounting system that enables you to mount the Nextbase RIDE to you motorbikes handlebars, fork, stems, etc. The Nextbase records in 1080p Full HD at 30 frames per second and this Nextbase bike cam has a 1.5-inch screen. Furthermore the Nextbase RIDE features WIFI compatibility so you can send recorded video to your smartphone to playback on your phones screen. The RIDE is fully waterproof to IPX6 standards. The Nextbase will therefore work in rainy conditions at high speed and will withstand weather conditions when parked or when riding on a motorway. 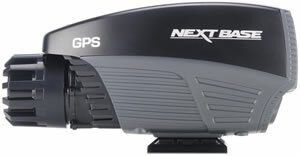 Featuring GPS and G-Sensor technology the Nextbase RIDE will record your motorbikes speed and G-Force data which you can view syncronised along with the recorded video on a Windows PC or Mac Computer using the Nextbase software which is included when you buy the Nextbase RIDE. The G-Forces detected can also trigger SOS data protection when an impact/event is detected making it impossible to record over or delete the video before, during and after the G-Force was detected. Loop recording mode records over old videos when the SD card is full meaning you will never miss an event along your journey. Any events stored as a result of the SOS data protection will be saved and prevented from being overwritten. There is also an in-built battery that will last for up to 1 hour. Video images are highly clear which is made possible with the Multi-Element Sharp Lenses and inbuilt processing which also enhances video quality when recording in bright and dark conditions. Do you have a question about the Nextbase RIDE that's not been answered on this webpage? Please see our Dash Cam FAQ's for questions from other people. If the answer to your question isn't featured, use the online form to ask us for the answer. Alternatively please telephone 01733 777623 Monday to Friday (9:30am-5:00pm) to speak to one of our sales team. The Nextbase RIDE bike cam has a RAM Motorcycle mount and power cable to install the Nextbase RIDE on motorbike fork, stems or handlebars. The Nextbase RIDE includes computer software to view the videos recorded on your Nextbase RIDE on a PC or Mac Computer.